Multilinguals perceive the world differently than monolinguals. When emergent bilinguals read, write, learn, and communicate, they draw from linguistic repertoires that are rich in a variety of linguistic features. Students’ unique bilingual perspectives must be recognized and celebrated by teachers. In the literacy classroom, teachers must design instruction in ways that encourage students to use their entire linguistic repertoires and highlight their bilingualism as an asset. In discussing texts, teachers can develop students’ identities as bilingual readers and writers by asking a range of questions and setting up activities that bring to the surface the very aspects of bilingual students’ identities and experiences that are often left out of the classroom. 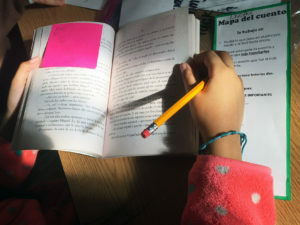 Setting up opportunities for students to talk about how they bring their unique bilingual readings to a text changes the conversation and brings forth new understandings. This means that students have more opportunities to take ownership of their reading and writing experiences. The writing process of bilingual students is also enriched when they use multiple modes of language (reading, writing, listening, and speaking), and their full linguistic repertoire to navigate it. 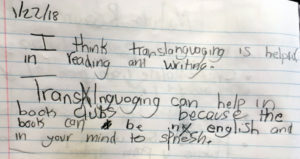 It is critical that students use their bilingualism in the writing process, as well as a literary device in their writing. Click here to access “A translanguaging pedagogy for writing: A CUNY-NYSIEB guide for educators”. Here are five principles that can guide teachers in designing an environment that fosters students’ identities as bilingual readers and writers. 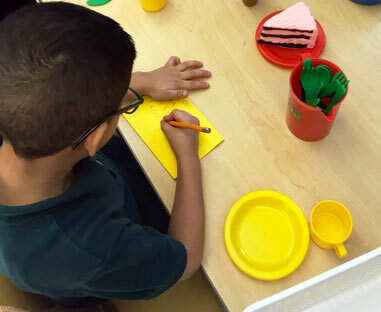 No matter the structures of the classroom, teachers can make space for linguistic flexibility when reading and writing with bilingual students. Teachers can begin by modeling how to use their bilingualism to make sense of texts. Regardless of the language of the text, it is important to encourage students to use their full linguistic repertoire at all times to engage with texts and to provide opportunities for students to bring their bilingual experiences into their analyses of texts, as well as in their writing. For example, when encountering an aphorism, teachers could discuss whether it still makes sense when translated to a different language and then have students share aphorisms with a similar meaning from their home languages. When students write a narrative, they can use dialogue that reflects the language practices of the characters. It is also fundamental to organize reading experiences so that they are more student-led and collaborative. Since language is so tied to who we are (and who families and communities are), this flexibility also means that students may feel more comfortable sharing parts of themselves and their experiences as they read. 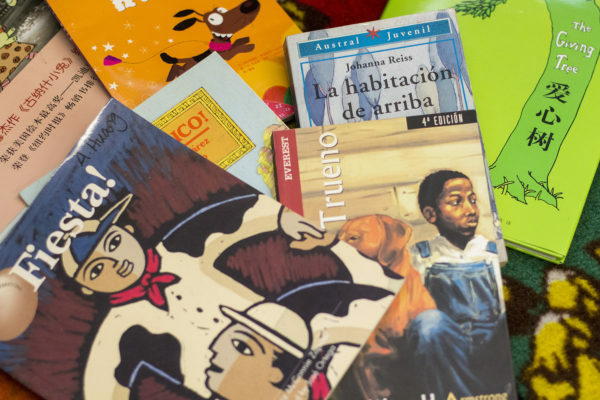 To foster students’ bilingual reading identities, it is essential that students encounter culturally, linguistically, and personally relevant texts. They also need to be exposed to texts that explore and represent a variety of cultural and linguistic experiences. These might include texts that were originally written in the target language, books that contain both English and the language other than English (LOTE), and books that use translanguaging in a variety of languages. Bilingual authors can be students’ mentors who teach them how to use their bilingualism to enrich their writing. It is fundamental to provide opportunities for students to think and talk about language and how it is used. Teachers can start by having students reflect on what they observe about language use in their communities in order to make connections to how authors use language. It is critical that teachers also model questions that encourage students to think about how languages are valued in society. In addition, as children read and write, they can explore the relationships between languages (Chinese, Spanish, Arabic, Bengali, English). Fostering metalinguistic awareness helps children to develop an understanding of and an ability to talk about language, both within and across language systems. It improves their ability to compare languages in terms of words and sentence structures, as well as their capacity to develop their conceptual knowledge and skills. For example, teachers can place multilingual versions of texts side by side and ask questions that hone students’ metalinguistic awareness and linguistic flexibility. When reading texts that use translanguaging as a literary device, it is essential to model the kinds of questions that a reader might ask to prompt students to think about the author’s choices and to think about how they can use language. Click here to see an example of children in an early childhood class re-presenting fairytales. It is important to encourage students to re-envision texts in ways that align with their bilingual and bicultural realities. In order to do this, teachers should ask students to re-imagine texts using their own language practices and local knowledge (i.e., alternative endings, new points of views, etc.). They also should provide opportunities to re-present texts (Walqui, 2006) in new genres, using new characters and voices. The process of re-presenting a text requires that students analyze the text and add their own meanings and interpretations as they extend it to create something new. During this process, it is fundamental to encourage students to flexibly use multimodal forms of communication so that they can enrich their re-presentation by using images, sounds, music, and any other semiotic devices that are part of their everyday lives. At the heart of developing bilingual reading and writing identities is the need to emphasize that being bilingual is a wonderful thing—within and beyond the school setting. In the classroom, teachers should regularly remind students that their bilingual perspectives give them an advantage in reading and writing. Educators must stress how, as bilingual readers, students have an advantage in using metalinguistic strategies to analyze text and, as bilingual writers, they can use their languages as literary devices. 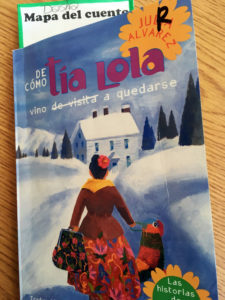 Learning about bilingual authors and their journeys can set the stage to explore students’ bilingual and bicultural identities in a way that leads to a deeper understanding of and pride in their own bilingualism. For more information about Latino authors, see The CUNY-NYSIEB Guide to Translanguaging in Latino/a Literature. This CUNY-NYSIEB resource was created by Gladys Aponte and Laura Ascenzi Moreno. Ofelia García, Kathryn Fangsrud Carpenter, Cecilia Espinosa, Zoila Morell, Kate Seltzer, Ivana Espinet, and Maite Sánchez, served as advisors to the authors. We would like to give special thanks to the teachers and administrators who provided feedback on this resource.